Milk chocolate foiled shapes, solid and with creme filling. 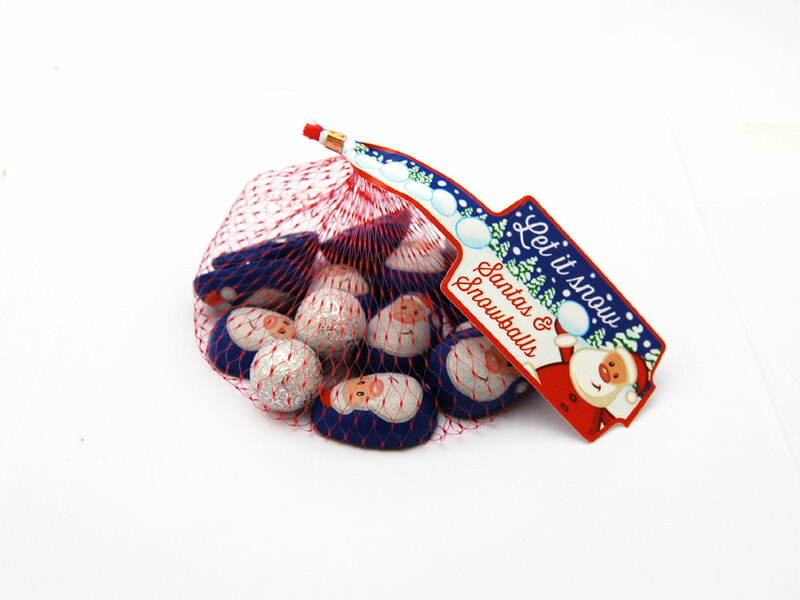 Scrummy milk chocolate santas and snowballs in a net with tag. Each net holds 100g of christmas milk chocolates. Milk Chocolate Santas: Sugar, Whole Milk Powder, Cocoa Mass, Cocoa Butter, Whey Powder (Milk), Emulsifier (Soya Lecithin), Flavouring. Milk Chocolate Snowballs With Creme Filling: Milk Chocolate (55%): Sugar, Whole Milk Powder, Cocoa Mass, Cocoa Butter, Whey Powder (Milk), Emulsifier (Soya Lecithin), Flavouring; Milky Creme: (45%): Sugar, Palm Oil, Skimmed Milk Powder, Whey Powder (Milk), Lactose (Milk), Whole Milk Powder, Emulsifier (Soya Lecithin). Milk Chocolate Contains Cocoa Solids 28% minimum, Milk Solids 16% minimum. Allergen Advice: see ingredients in Bold. May also contain nuts and cereals containing gluten.